Jelly Beans originates from Sierra Mixta, San Luis, and Oaxaca, Mexico. 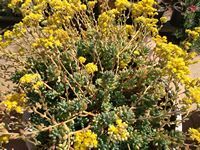 It is a bush forming or ground-hugging succulent, up to 30 cm tall with thick blue green leaves resembling jelly beans and which are about 2.5cm long. In summer it bears yellow star-shaped flowers. When grown in full sun and in cooler dry weather, the plant's leaf tips will take on a reddish hue. It is drought and heat tolerant, needs light shade to full sun and will take cold up to -6.7°C. Jelly Beans is suitable as a houseplant in a bright indoor location. Outdoors it will makes a nice pale sea green ground cover over time. 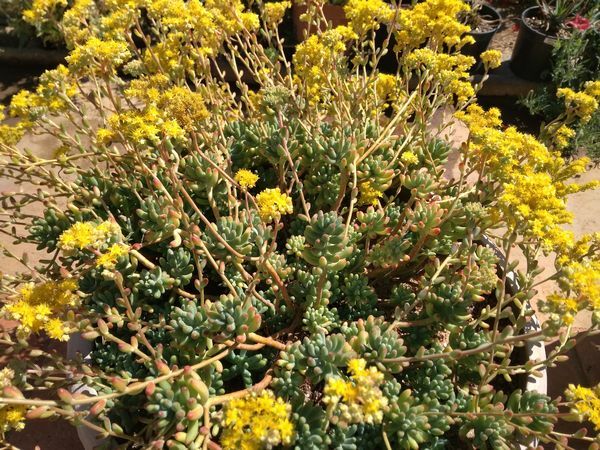 Good for the rock garden when grown with other contrasting sedums and small succulents.